When Keegan Reilly goes through the tick list of everything that can possibly go wrong growing hops at his five-acre Thirsty Toad Hops Farm on the Western Slope of Colorado, the last item on the list is the bear. 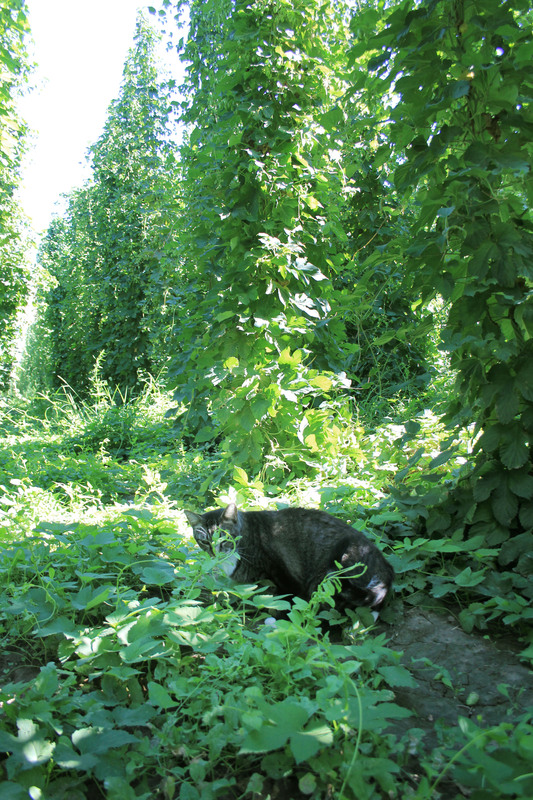 Not that he and his partners have actually ever seen a bear, but they have found what bears do in the woods – or in this case, between 20-foot-high rows of hops plants where the beast likes to sleep. The “bear” that stalks every hops farmer takes many shapes. Put your hops plants in the ground at the wrong time, and you cannot put enough water down for survival. Get everything right during the grow, but deliver the hops not cured to a very narrow range of moisture, and the brewer will reject your harvest right on the truck. And then there is the wind, which at The Thirsty Toad Hops Farm recently took on grizzly proportions. On July 29, just weeks before the harvest, a powerful localized storm struck Palisade. Many locals claim the torrential downpour and howling wind were a 50-year weather event. The bear came calling and swatted down an acre and a half of the tall, lovely hops vines. Extension agent Ron Godin, the man responsible for introducing hops growing to the Western Slope, believes a micro-burst touched down between The Thirsty Toad and another hops farm just to the west. “The Reillys’ plants were pushed over to the east and the other hops lot had plants pushed over to the west,” says Godin, a PhD Agronomist/Soil Scientist with the Colorado State Extension Service. “The good news is, I believe most of the harvest is salvageable.” Both Godin and Keegan stress that there is no past precedent to predict the best course of action. “We’re making this up as we go along,” Reilly says. Hops farming is much different than in the Pacific Northwest, where most of the hops used to flavor and bitter our beer is grown. In fact, five years ago there were no hops farmed on the Western Slope. “I started growing research trial hops on the Western Slope in 2002,” says Godin, a home brewer. “By the time a hops shortage hit in 2008, my phone was ringing off the hook from Colorado brewers and farmers about growing hops,” he recalls. In five years, Godin said he calculates the infant crop category has grown in value to about a million dollars. And this, amazingly, on just 75 total acres in production. With the bear always lurking, why would anyone be a hops farmer? For Keegan, a 33-year-old former computer science geek who also happens to be a paraplegic, he wouldn’t have it any other way – even with the setbacks and hard work. “I was working in Denver, locked indoors, getting outside less and less and losing touch with my friends. I was fat and out of shape. When my parents told me they were looking at moving from Alaska to Palisade on the Western Slope, at that point in my life it sounded like a great idea,” he says. He made the decision to go in on the venture fifty-fifty with his parents, Mark and Maggie Reilly. The three, who had never farmed before, had no idea what they would grow. They were, after all, a family of fishing guides from rough and tumble Alaska. While Keegan was looking for more active work and lifestyle, his parents were motivated by the one-two punch of 9-11 and the great recession. “Having a place inland of our own to grow and raise food had enormous appeal,” Mark says. “Land in Palisade was relatively cheap compared to the Pacific Northwest. We knew we needed to grow something we couldn’t kill, and peaches made us nervous – too susceptible to frost,” he explains. But would-be hops farmers are warned: growing hops is hard work, much of it done by hand. The new spring tendrils must be trained to climb clockwise to match the rotation of the sun up the 20-foot trellises. Godin estimates labor costs at $2,000 an acre to train, string and trim a hops crop. There is no machine to accomplish these tasks – it’s all handwork. Equipment to mechanize the picking and drying is generally bought used from Europe, where hops have been grown in similar small “hops lots” for a hundred years. Such small-scale farming is totally different than in the Pacific Northwest, where hops farms can stretch up to 1,000 acres or more. 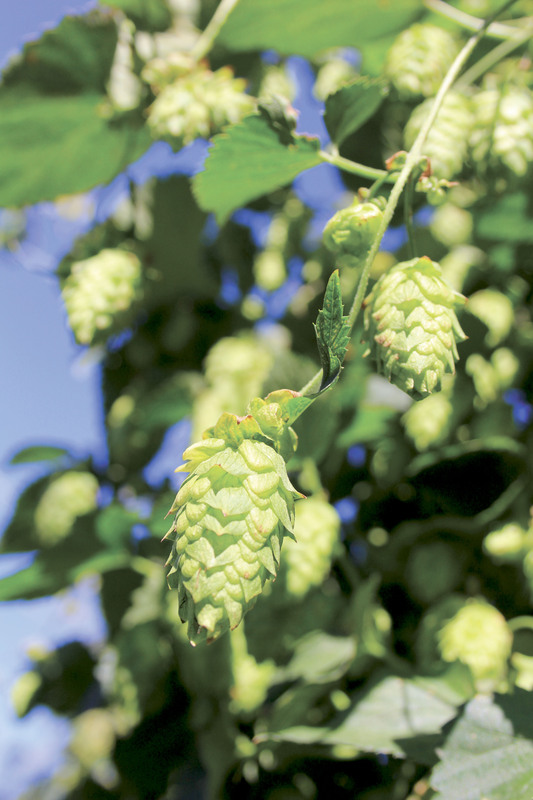 “When we put our first crop in two years ago, the most experienced Western Slope hops farmers had one harvest season under their belt,” Keegan notes. Keegan, who was injured in a car crash when he was 15, waves off any concern about his disability and his ability to be a farmer. “I’ve been in a wheelchair half my life now; I don’t give it too much thought. The biggest problem I had was trying to haul myself up on a tractor before I lost 30 pounds,” he says with a quiet smile. Both Keegan and Mark cite the support they are getting from Colorado brewers, including from AC Golden Brewing, to establish a hops supply. In the meantime, the people of The Thirsty Toad Hops Farm will be working to get their windswept harvest in. Then they will construct a new trellis system designed to get one step ahead of the bear.